As an HR professional, you work hard to bring wealth creation opportunities to your executive team. It can be frustrating to know that many executives are not fully capitalizing on the value available to them through their compensation, benefits and incentive plans. But, overextended as you are with the demands of HR, there simply isn’t enough time in your day to help each executive understand the complexities of their incentives and benefits programs. 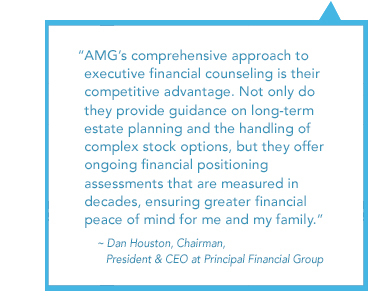 With AMG as your executive financial counseling partner, you can confidently deliver value to your leadership team, helping to raise the productivity and focus of senior executives by providing them with greater financial peace of mind. You’ll solidify your position as an indispensable member of the leadership group, while also driving executive job satisfaction and stronger talent retention. At AMG, our advisors have extensive experience working with Fortune 500 executives. We are committed to fully understanding each company’s specific compensation and benefits plans so executives can maximize the wealth building opportunities your hard work has made available to them. Our advisors have comprehensive expertise and can provide objective guidance across all financial components of an executive’s life, maximizing efficiency and creating wealth. Want to learn more about how you can become indispensable to your senior executives? Complete the form below and we’ll share our latest research findings with you this summer.